Lunchbox Dad: Review: ips Egg White Chips, Big On Health But Are They Also Big on Taste? 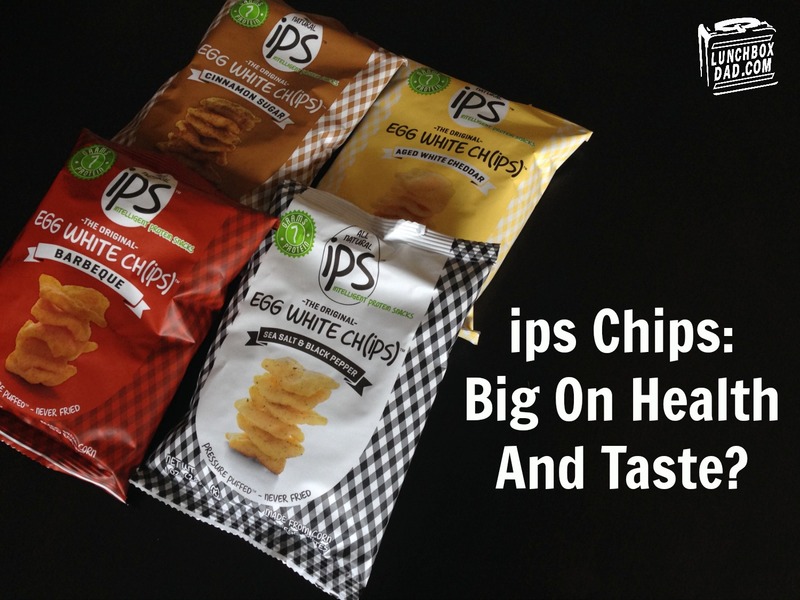 Review: ips Egg White Chips, Big On Health But Are They Also Big on Taste? Egg whites...and chips? That is the thought that first ran through my mind when I heard about ips (Intelligent Protein Snacks). Honestly, when ips first offered to send me samples to review, I thought the idea of these chips sounded crazy. I almost said no. Then I saw the flavors, and said to myself, "Why not give them a shot? I'm always looking for healthy alternatives"
Founder Sean Olson started ips with cooking eggs in his kitchen. His kids liked the crispy edges and the idea for egg white chips were born. ips states that their chips have 7g of protein in every chip, 50% less fat than regular potato chips, and less carbs than leading baked chips. They also have no artificial flavors or colors. They credit their patent-pending Pressure-Puff process for the taste. Although I like to find healthy alternatives, especially to snack foods I love, those healthy alternatives still need to taste good. ips chips come in four different flavors: Barbeque, Sea Salt and Black Pepper, Aged White Cheddar, and Cinnamon Sugar. I not only wanted to see if these chips could win me over, but my kids as well. The chip's shape and texture are similar to other baked chips. They also are very light and don't make you feel like you have a pint of grease on your hands afterward. The Sea Salt and Black Pepper impressed my kids. They weren't sure at first but they said this flavor was great. I thought it was a little heavy on the pepper, but if you enjoy that, you will really like this flavor. The Aged White Cheddar tasted similar to other baked cheddar chips on the market, but it didn't have quite the distinctiveness of the Black Pepper flavor. I felt the Barbeque chip's taste fell short. They didn't have smoky flavor I enjoy, but my kids disagreed. They finished off the bag with no problem. The last ips chip we tried was the Cinnamon Sugar. This was hands down the best of the four. I usually prefer savory chips, but the perfect balance of the sweet with the light and fluffy texture worked perfectly. My whole family were wishing for more long after the bag was finished. These are healthy enough for an afternoon pick-me-up snack and sweet enough to be dessert. If you are only going to try one flavor, get these. ips snacks might be too different of a taste to fit everyone's desire, but if you are looking for a healthier chip with a lighter feel, give ips a try. They might surprise you. For more information check out www.ipsallnatural.com. Disclosure: intelligent protein snacks sent me their products to review. I have received no other compensation for this post and the opinions I’m expressing here are solely my own.